Believe it or not, about 75 million years ago, Lethbridge was a tropical paradise covered in tropical flora like ferns, fig trees, magnolias and even palm trees, over which where birds flew free and where dinosaurs like the hypacrosaurus and other members of the hadrosaur (duck billed dinosaur) herbivore family roamed. This is the scene at the Galt Museum, where a new exhibit on southern Albertan dinosaurs opens , Saturday, Oct. 17. The family focused exhibit, on loan from the Museum of Nature and Science in Sherbrooke , Quebec, is at the Galt Museum until Jan. 31. It includes fossils and casts of fossils and plenty of interactive exhibits which examine dinosaurs living in southern Alberta during the Cretaceous period, approximately 75 million years ago which is about 10 million years before they became extinct. 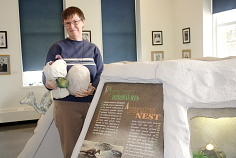 “It was much different then,” enthused Galt Museum curator Wendy Aitkens adding the exhibit examines the environmental impact as well as extinction theories and dinosaurs’ interactions with early mammals. “There’s lots of things for people to explore,” she said adding there are lots of programs lined up including guest speakers and other activities related to the exhibit as well. The exhibit also includes a section on the process of paleontology — all of the procedures used to uncover dinosaur bones. Another part of the exhibit focuses on how dinosaurs may be related to birds. If the In the Shadow Under the Bridge festival, Sept. 5 piques your curiosity for more Bridge trivia, then check out the third Cafe Galt presentation, Sept. 8. 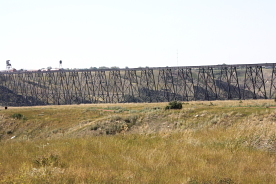 Belinda Crowson will debunk some of the myths surrounding Lethbridge’s steel runged railroad icon during the last Café Gault presentation about the bridge at the Gault Museum. The presentation will help draw the museum’s latest display focusing on the Bridge’s 100th birthday to a close. “One thing we get asked a lot is if we’re called Lethbridge because we’re located left of the bridge,” Crowson chuckled. “A lot of stupid and illegal things and highly dangerous things are said to have occurred around the bridge. Did people fly planes through it? Of course the older planes had shorter wingspans. Did people cycle across it? Does the ghost of the man who designed the bridge still haunt it?” she pondered, suggesting some of the strange stories she will tell about the bridge. 10th St. & 4th Ave.
in temporary location 324 5 St. So. 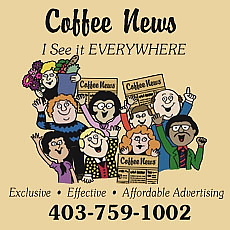 403.381.8888 104 5 St. So. Museums, Galleries and Shows in and around Lethbridge for the month of June. Hours: 9 a.m.- 9 p.m. Hours: 11 a.m. -4 p.m. Hours: 9 a.m- 9 a.m.